7 Tips on How To Do Your Taxes Online Yourself - HBS Financial Group, Ltd.
(GAL) – I can tell you from personal experience, that learning how to do your taxes online is not at all difficult, unless you have a tax return that is very complex. And now, with the new tax reform act, most individuals will be able to file their taxes using the increased standard deduction. The average taxpayer that is buying a home, perhaps is married and has one or more children, and is employed and paid with W-2 wages, is the perfect candidate for online tax filing. If you were to take that type of tax return to a local CPA, you can expect to pay $250.00 and UP, and there is no need to do that. Even those tax returns that have a Schedule C business schedule, or even a Schedule E rental property, can easily file their taxes online. You don’t need to be an accountant or a tax specialist either. Simply gather all of the tax forms that were mailed to you, and be sure that you maintained good records for the business and rental property, if applicable, including saving the receipts, and familiarize yourself with them. Several years ago, when most tax returns were completed by hand, it was a lot more difficult, but today, the online tax filing software is so intuitive, it practically does it all for you automatically. The best part is when your return is completed and reviewed, and the program tells you to click the e-file button. 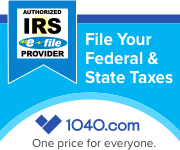 Just as soon as you do, the returns are filed with the IRS and your resident state. Sure beats the old snail mail. There are seven tips that we can offer you so that you will know how to do your taxes online yourself and save a lot of your hard-earned money. If you follow them, you’ll see for yourself just how easy it really is. First, set up a folder to keep your receipts in for the year. If you have a side hustle that will require a Schedule C, keep a ledger book to record all income and cash and check expenditures. When tax time rolls around, it will be very easy for you. Anything tax related should go in this folder. Assuming that you won’t be having a business or rental schedule, keep all medical receipts, real estate tax bills, charitable contributions, etc. If you are buying a home, and have a mortgage, there’s a chance you may be itemizing deductions rather than taking the standard deduction. Our intuitive program will check to make sure though, of the best way for you to file. If you do your taxes online, the tax program will ask you a few interview questions, and based on your answers, will get the required forms ready for you. Learning how to do your taxes online is not rocket science. Before going online to file your taxes, you should gather all of the forms such as W-2, bank interest forms, bank forms for mortgage interest paid, and other statements issued by your church or other charities for total contributions made during the year. Keep the Goodwill type forms as well with a realistic value on them. To enter the information from your W-2, etc., you will find forms on your computer screen similar to yours, so just type it all in. Fill in the various forms presented to you such as dependents, if any, spouse information if married, etc. Many online tax programs offer you a Free federal return if your return is simple and is under a certain total income limit. With our program, you don’t even have to know if you qualify. After you enter your information, the software does a calculation and will prepare your return for the lowest price automatically. Finish entering your information and let the program calculate your return for your review. It also checks your return for accuracy, and for every deduction and tax credit that you may be eligible for, and does that for you as well. This is fast…easy…100% guaranteed accurate! After your review, you have the option to have your small fee deducted from your refund so that you won’t need a credit card. You can also choose to have you refund(s) directly deposited to your bank account. This means that you can get your refund in a matter of a few days. If by chance, you have a balance due, you can elect to have the IRS debit your bank account, or you can pay online. You can even choose to mail in a check. After your return is filed, you will receive an acknowledgment in a couple of days. We hope these 7 tips have convinced you that knowing how to do your taxes online is so easy, and just how much you will save by doing them at our site. At our website, we go even further. We encourage you to do taxes online with us and get your refunds in a few days…deposited right in your bank account. Here’s the link to make your online tax filing a breeze. Try it out free…no obligation. The new tax reform law, I believe, has made my tax return much easier to do. I no longer will be able to itemize my deductions, and no more personal exemptions. As long as I still get a small refund, I don’t really care what the IRS does. Thanks for stopping by Darleen. For many taxpayers, there will be no need to itemize deductions with the new standard deduction. Do check with your state to be sure itemizing may have a higher refund, combined. I did a test return on your site to see what it is like. I’m pretty well organized, and just answering the few interview questions, everything seemed to fall into place. Granted, my return will be filed using the new standard deduction, so it should be easy to do. I’ll be back in February if the IRS will be open. Thanks for your comment Tim. Glad to hear our site will take care of your filing, and we look forward in having you come back. I see what you mean when you say doing taxes online is so simple, and you don’t need a tax preparer to do them. For many years, I’ve been going to a H R Block store down at the shopping center. I have a simple return, no itemizing, and each year, the fee goes up quite a bit. Last year, for federal and state, I paid $190.00. I’ll be back when my forms come in and will give it a shot. Thanks for sharing Carolyn. You’ll find our online tax filing fee much, much lower than your tax preparer.Hope to see you back. Thanks for the very useful tips. Even if I’m not able to itemize my federal deductions, I may have to because of my rather high state income tax rate. If I’m close to the new standard deduction, I’ll have to work it both ways because of the state low standard deduction. I don’t like the idea, though, of losing the exemption deduction for my husband and I plus our two sons. Thanks for your comment Anna. It looks like you’re right on track by doing a comparison of federal and state returns both ways. You’ll be able to do that on our filing site very easily.